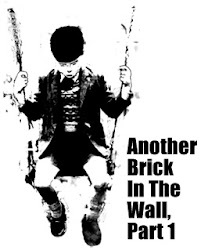 Another Brick in the Wall: "Ananda" again? Market rigging this time? By chance, this blog have been picking on Tatparanandam Ananda Krishnan. 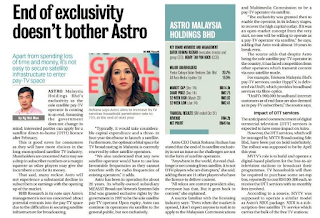 The earliest remembered must be a legitimate issue on Astro in early 2014 here. 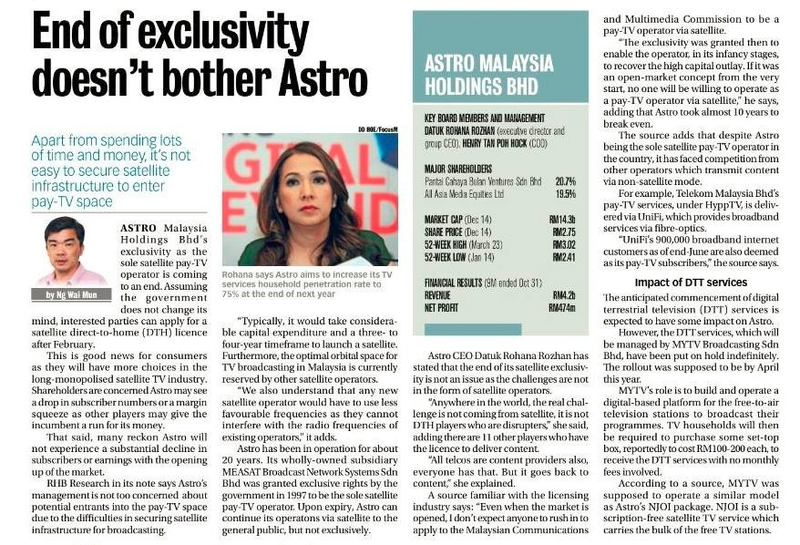 By February 2017, the exclusivity given to Mahathir's crony or sometimes believed to be proxy should end. But it is 20 year too late. They are too entrenched and can afford to be arrogant. By chance, this blogger stumbled on a LSS's FB posting on Usaha Tegas on a could be scam to develop the Turf Club along Jalan Ampang into KLCC. It was reproduced in this August 2016 posting here to ponder on what motivated Mahathir's to attack on Dato Najib. The belief that Ananda is Mahathir's proxy is strengthened by the recent revelation here from Tun Daim's lead on a lease and "lesap" scam of Ananda to get prime land for cheap at Bukit Kiara. "I am just doing my job", he told Sydney Morning Herald in 2011 here. There is a warrant of arrest against Ananda in India [read here and here] which the authorities there bungled on the procedure. There is the suspicion it is beyond the issue of business but security. This posing is about another scam that tantamount to illegally and outrightly intended to rig the stock market through a press statement by another Ananda. This time it involves his nephew, Robbie Hari Krishnan Tatparanandam. Yes, it is not Ananda himself but since it is known that his only son is more reclusive than he is, Robbie could be his heir apparent. 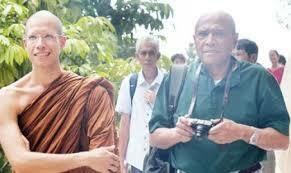 Ven Ajahn Siripanyo is a monk. He was reported saying he is not interested to join his father's business. Maybe he realised his wealth is not vegetarian. Both of Ananda's two daughters too are not interested in taking over his business. Young Robbie called for a press conference recently and told the press that his company, Ace Market-listed MQ Technology Berhad (MQtech) is in talk to venture into gambling venture in Cambodia. KUALA LUMPUR: Ace Market-listed MQ Technology Bhd (MQTech) is in talks with gaming giant NagaCorp Ltd over plans to build a casino in its new integrated resort and entertainment project in Cambodia. MQTech executive director Robbie Hari Krishnan Tatparanandam told a press conference here that the project was estimated to cost US$51.1mil (RM225.86mil). “We are talking to NagaCorp regarding this and we are working with them. This project will be the very first integrated theme park resort and casino project in Cambodia,” he said. NagaCorp Ltd, which is the largest casino operator in Cambodia, was awarded a 41-year monopoly to operate casinos within a 200-km radius from the Pnomh Penh city centre. MQTech’s proposed project site is about 103km from the capital. Krishnan was appointed to MQTech’s board of directors last week. It is undeniable. Read on here. Market operators is known to leak info for business reporter to write and not to mention, spread rumours through known "speaker kampong" of Bursa Malaysia to boost positive sentiment and get followers for them to rig the share prices of a particular stock. But, never ever have it done through a formal press conference with audio and video tapes all over. The Executive Director of MQ Technology Bhd, Teh Eng Huat, has also resigned suddenly. 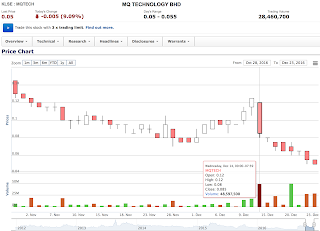 Teh Eng Huat was among the few shareholders subscribed to MQ Technology Bhd Right Issues recently, with well undersubscription, resulted in majority close to 75% of the MQTech shares held under less than 5 persons name, potentially breached mandatory general offer, or take over code. 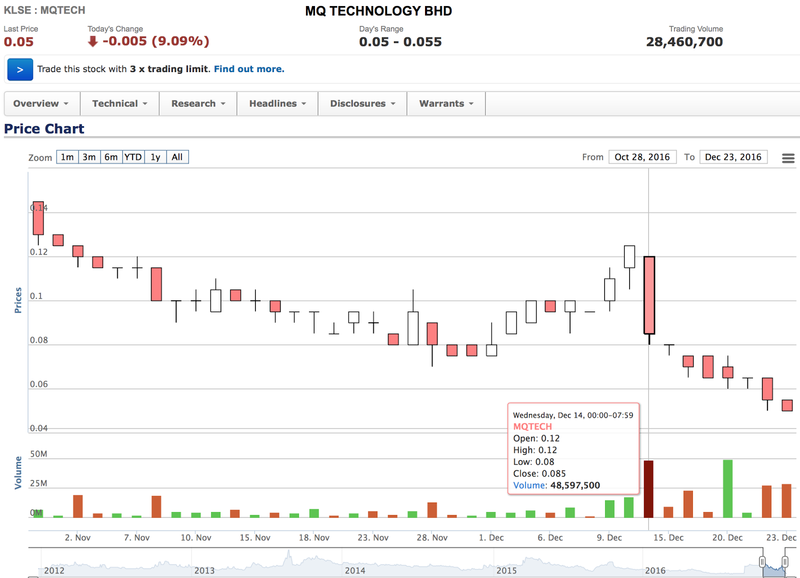 MQ Technology Bhd plunge 31%, warrant crash 58.33% in a single day. Bursa Malaysia have not issue any Unusual Market Activity (UMA). It looks to be a classic pump and dump securities fraud for Teh Eng Huat to sell his shares. It is confirmed in their December 16th posting here that Teh sold his shares. And young Robbie is part of this securities fraud. The Cambodian authorities denied any such application and it is a hoax [read here and here]. Apparently, Cambodian government is planning to double gaming tax from an effective 2% to 4-5% [read here]. And, one of Nagacorp shareholders is selling out [read here]. Nagacorp is faced with a surprise back taxes upon an audit [read here]. Nagacorp have been talking for a while of various expansion plans and bid for new casino licences. So it looks like the false and positive misleading news to pump and dump could be well planned to involve Nagacorp too. The noise made apparently did not instill fear in Teh Eng Huat as he sold more shares on Christmas Eve on December 23rd. Another substantial shareholder, Goh Boon Soo @ Goh Yang Eng was in on it too! [read i3 investor.com here]. This is a major fraud worthy to be dubbed as fraudster of the year by i3 investor.com here. And yakety yak ... SC can only say warn MQ Tech and not hesitate to take action. So mellow and scripted reporting by accomplice The Star [read here]! It is the same reporting by MMO here so it is SC saying so. 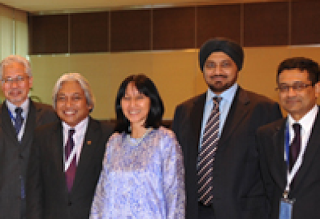 It comes back to our July 2016 posting here which made the allegation that even Dato Ranjit Singh too seemed as incompetent as the Malaysian version of crooked Hillary, Tan Sri Zarinah Anwar. Now she is appointed on the Board of PNB... sigh. SC failed to play their role as watchdog in the 1MDB debacle. They are as much a possible accomplice to Jho Loh as BSI, Falcon and probably Goldman Sachs that underwent and is underging due process in the Singapore court. Ananda's nephew should be investigated because he was the one who spoke about the Nagacorp acquisition. He just joined the Board and yet he spoke, which could implicate Ananda. He happen to be a gambling operator in Malaysia. Since 1MDB is mentioned, his uncle is also a scam artist in the 1MDB debacle and went around telling everyone 1MDB owned him RM2 billion. The fact is 1MDB wanted Powertek for RM6.5 billion but he demanded and insisted on RM8.5 billion despite banks are only willing to finance for RM6.5 billion. The wunderboy con artist Jho Loh was, he agreed to the price and designed a scheme. For the RM2 billion, Ananda was given the right to subscribe in the shares of Edra in the event the RM2 billion was not paid. 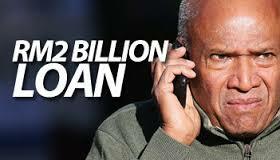 Ananda met the bank to help convince them to lend 1MDB and placed RM1 billion deposit to the Bank as commitment. Come 2015, Mahathir made it such that 1MDB could not get listing and the money to Ananda defaulted. The far from smart and unschooled Keling-Keling cyber trooperss of Mahathir simplified it as loan to Ananda for RM2 billion. 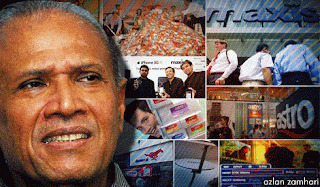 When the time came to honour his commitment to subscribe the Edra shares, since 1MDB did not pay him on time, Ananda did not honour his end of the bargain. Do not be fooled by his involvement in Bob Geldof's LIVE Aids concert in the mid-80s and other philantrophic works. What you see in Ananda is not what you get. Even his children do want to be involved with his business. There is more to come. Watch this blog.